Munich, Marktschellenberg (June 19th 2014 11:44). After 11 days 10 hours 14 minutes, a total of 274 hours Johann Westhauser was today successfully rescued from the “Riesending” cave in 1000m depth. “This operation was only possible because the best of the Cave Rescues from Europe helped together here,” said Clemens Reindl, operations manager of the rescue. A total of 202 cave rescuers were in operation in the cave, 175 of them from abroad, from Austria, Switzerland, Italy and Croatia. The successful rescue is due to them. They were supported by a total of 522 rescue workers in the field who have taken over the particular logistical services. There are also forces of fire, police and armed forces, which also have given the support with helicopters. I total round 1000 rescuers where in duty. 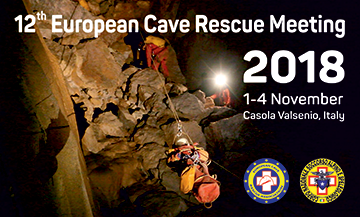 “The use has shown the importance of international collaboration in the field of cave rescue” stressed Baksic Darko, President of the European Cave Rescue Association (ECRA). In the future, it is important that they are alarmed earlier.Baksic also appealed the European policy to create better conditions for international cooperation of rescue teams. “Just the Mountain Rescue would this use can not cope” says Hermann, Minister of State for the Interior and thanks all cave rescuers.